Today is our three-month anniversary. I mentioned earlier this week that John and I have been working out since March, and I knew when we started that I was in dire need of new shoes. My current pair should have been retired a while ago. My knees will ache after running in them, which is a telltale sign. Anyway, last night after picking up groceries, when it had just begun to snow huge, wet flakes, we spontaneously decided to hit up my favorite running store, Mill City Running, and buy each other a little anniversary present. Because my mileage isn't high- and won't be for a while- I told them I wanted something a little "softer" than my beloved Mizunos. 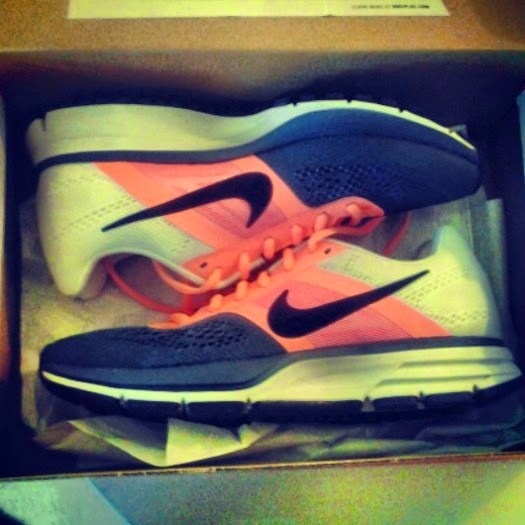 So, after several trips on the treadmill, I settled with these beauties. Tonight, dinner at home, and an early bedtime. Because we're an old married couple. Hope the run went well! Wonderful gifts. When we were younger, did we think that dinner at home and an early bedtime would sound so great? haha!